All year round the Philippines’ calendar is filled with different festivals which are celebrated with the most delicious food, the most beautiful flowers, the most colorful costumes, and the most amazing parades with music and dance moves. If you are planning to participate in the coming major Filipino festivities this year, here are ways Transportify logistics can help you celebrate! Aside from cakes and cupcakes, Transportify also accepts other food delivery service requests like lechon deliveries. We also offer food transportation to catering businesses. If you are expecting a landslide of food orders due to the festival and do not have enough delivery vehicles to transport them to all of your customers in time, just book a transaction with Transportify using our web and mobile app. The lively festivals in the Philippines are made more vibrant with flower decorations that are either worn by parade dancers or pinned on props and mobile floats. Some houses are even adorned with brightly colored flower garlands. Since Transportify is a company that accommodates flower deliveries as well, you can count on our services if you need flower materials delivered to your home before the festival proper to prepare them for the event. Do not know how to transport costumes that need extra care in handling? You can rent a van from Transportify and make sure that those delicately ornamented costumes are safely delivered from their pickup point to their drop-off destination. Our L300 van can provide those costumes with enough space and comfort to keep them from damage before use. It has been a habit of festival organizers to spend as less as possible, which sometimes results to renting jeepneys and tricycles to transport fragile props or other event needs like musical instruments and outdoor chairs. For an affordable yet safe way of getting big and delicate props and musical instruments from one place to another, book one of Transportify Philippines’ vehicles and avail its full day delivery service option. Delivery vehicles that are solely at your service for the whole day can also make your festival planning tasks easier and lighter. Just like the previous years, 2018 is sure to have joyous celebrations. To ensure the success of these proudly Filipino festivities, use Transportify’s logistics services. For successful festivals this year, use Transportify’s logistics services to transport food for the feast, flowers for decorations, costumes for the parade performers, as well as props and musical instruments. 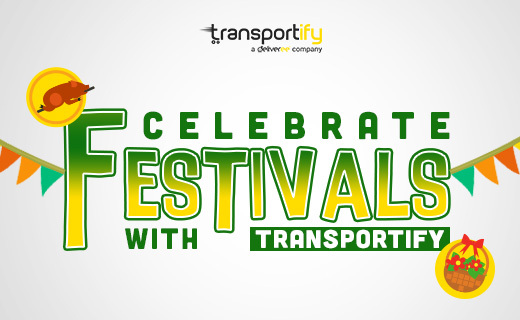 Enjoy a stress-free festival with Transportify’s reliable but affordable delivery services.